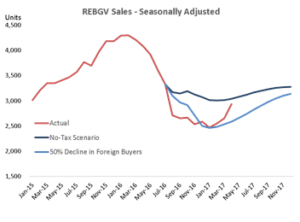 To get a sense of how the foreign entity tax impacted home sales in the months following the introduction of the tax, it is necessary to compare today’s sales to the correct counterfactual of where sales would have been absent the tax. This is particularly true given that home sales had already been cooling off since the spring of 2016, and simply comparing a lower level of sales in August to the heights of the market in the early part of the year would dramatically overstate the impact. To provide a more appropriate benchmark, once the tax was announced, BCREA simulated how home sales in the REBGV area would evolve under a no-tax scenario. We also conducted a separate simulation under the assumption that about half of the measured foreign investment for the REBGV area would be pushed out of the market. 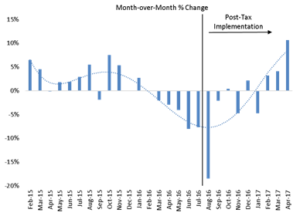 It turned out that the impact of the tax was much more immediate than in our simulation, owing to sales being brought forward to July to avoid the tax. Indeed, total REBGV sales fell 19 per cent in August 2016 compared to our projection of just 8 per cent. However, since then, sales have evolved broadly as expected in our scenario analysis. In fact, since the end of 2016, other than a weather-induced blip in January, home sales have been on an upswing and are where we would have expected them to have been at this point, without the tax. Some of that added momentum in the market is due to a return of some foreign buyers, though to less than half of the levels observed in the summer of 2016. That isn’t to say that the tax has had no impact. Given the preference for foreign buyers to invest at the luxury end of the market, it is no surprise that the tax has had its largest effect on that part of the market. Sales of homes priced over $3 million ramped up in the first half of 2016, reaching 5 per cent of total Metro Vancouver sales in February. By August, when the tax was implemented, that share had already fallen to 3.6 per cent and continued to decline with the introduction of the foreign buyer tax. However, like the rest of the market, sales of luxury homes have also returned to more normal levels in the first four months of 2017. That experience is mirrored in the overall market for single detached housing, which peaked at 47 per cent in the first quarter of 2016 before falling to only one-third of total sales by the end of the year. Additionally, there has been minimal leakage of foreign investment outside of the Greater Vancouver area. In fact, the regions that remain untaxed have seen relatively stable levels of foreign transactions following the imposition of the tax. The Capital Regional District of Vancouver Island, which encompasses Victoria, did experience two months in which the share of foreign investment briefly spiked higher, but since August the share of foreign transactions has averaged just 5.2 per cent. Moreover, the absolute level of transactions by foreign entities in the Capital Regional District has been trending lower for months, and the slight rise in the share of sales from foreign buyers is more a function of cooling overall sales than rising foreign investment.